Obama calls on Americans to "renew a sense of common purpose"
(CNN) -- President-elect Barack Obama visited military personnel and their families enjoying Christmas dinner at a Marine Corps base in Hawaii Thursday during his holiday vacation. 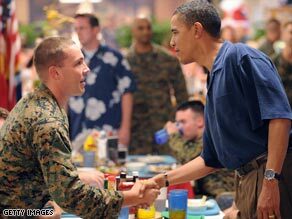 President-elect Obama shakes hands with troops having Christmas dinner at a military base in Hawaii. Obama went to Marine Corps Base Hawaii Kaneohe Bay on Oahu where he mingled with Marines and sailors. Obama and the troops also had a traditional dinner including turkey, roast beef, ham and trimmings. Obama, dressed casually in a blue polo shirt and dark khaki trousers, chatted casually, shook hands and posed for photos with men and women in the dining hall, which had been decorated with Christmas trees and Santa figurines. Shortly before Obama entered the room, a Marine shouted to the crowd scattered across 25 tables, "You need to take you seats, the president-elect is going to be coming." Obama, who spent about an hour at the Marine base, worked his way around the room, table by table. "Just wanted to say, 'Hi, hey guys,'" Obama said at one point while reporters were allowed in the room. "Hey guys, Merry Christmas," he said to another group. Obama also highlighted the service of the country's military men and women now overseas in a holiday message to be broadcast on radio this Saturday. "As we celebrate this joyous time of year, our thoughts turn to the brave men and women who serve our country far from home," he said in the message, which was posted online Wednesday. More than 140,000 soldiers are currently serving in Iraq, as well as roughly 30,000 in Afghanistan. In the broadcast message, Obama also called on Americans to "renew a sense of common purpose and shared citizenship." "These are also tough times for many Americans struggling in our sluggish economy," he said. "Now, more than ever, we must rededicate ourselves to the notion that we share a common destiny as Americans -- that I am my brother's keeper, I am my sister's keeper. ... We must all do our part to serve one another; to seek new ideas and new innovation; and to start a new chapter for our great country." Obama said that notion "will guide my administration in the New Year. If the American people come together and put their shoulder to the wheel of history, then I know that we can put our people back to work ... and reach the promise of a brighter day."